"Every year, we learn more on how to improve things and make sure we don't make the same mistake twice, believe me, there's been a few!" 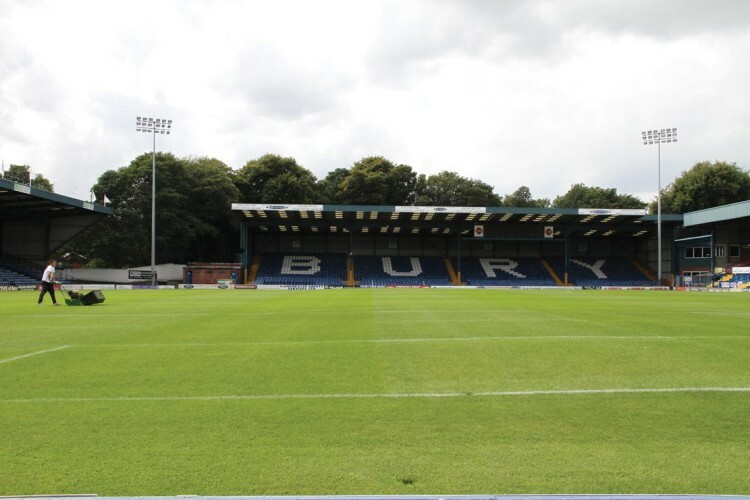 Gigg Lane has been Bury Football Club's only home since it was founded 125 years ago, back in 1885. Affectionately known as 'The Shakers' which was bestowed upon them by then club chairman and manager, JT Ingham, an industrialist and ironmonger of the late 1890s, when he was asked about his team's ability to beat supposedly much stronger opposition in the shape of Everton. "We will shake-em", was his reply. And they did, reaching the Lancashire Cup Final. The first ever game took place on 12th September 1885, when Bury played a friendly match against Wigan and won 4-3. The first ever Football League game to be played at the ground was on 8th September 1894 when they entertained Manchester City in a Division Two game and won 4-2 in front of a crowd of 7,070. The ground has been extensively redeveloped in recent years. Beginning in 1993, all four sides of the ground have had new stands built, the final stage being the rebuild of the Cemetery End almost ten years ago. Capacity currently stands at 11,840 - considerably less than the pre-war figure of around 32,000. In the early 60s the capacity was increased to 35,000. The record crowd at Gigg Lane is 35,000 for an FA Cup third round tie against Bolton Wanderers on 9th January 1960. 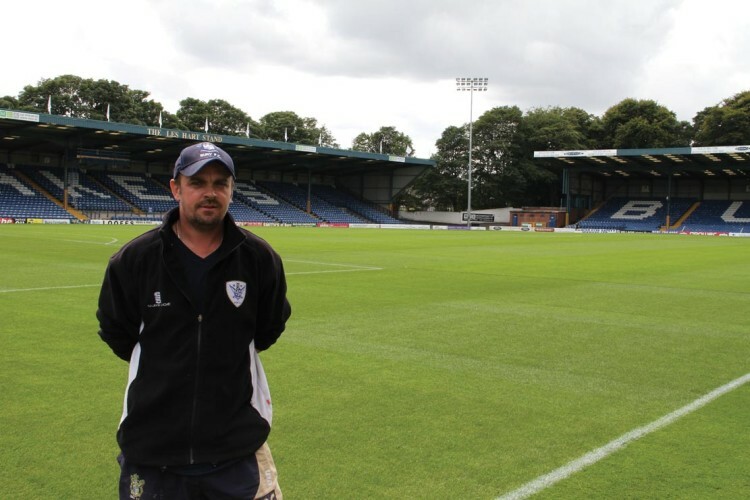 Over the years, Gigg Lane has also been used for rugby league, baseball, cricket, wrestling, American football, lacrosse, police athletics and sports meetings, Lancashire Fusiliers regimental parades and a Girl Guides convention. 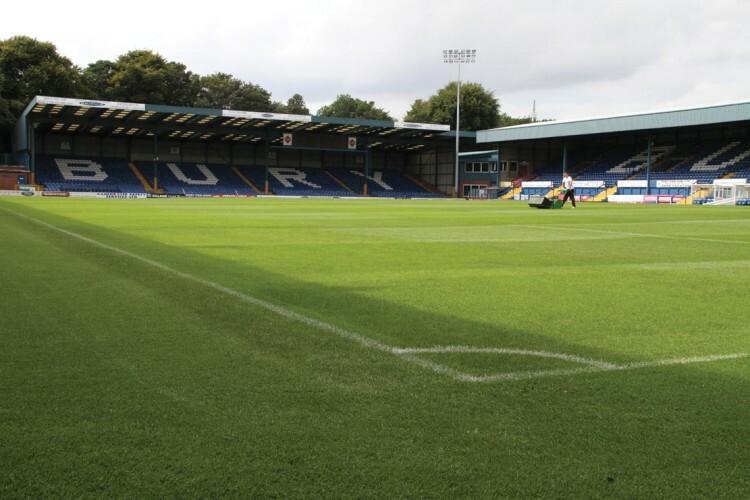 Bury currently share their ground with FC United of Manchester, a spin off from another team from Manchester! However, this arrangement is probably coming to an end this year. He has two assistants, Andy Bateman, who has been at the club eighteen years, and Michael Warburton, who joined straight from school and has been at the club for five years. Michael's grandfather is Bill Gorman, who played eleven times for the Republic of Ireland and remains the most capped international to have played for Bury. Michael is also the kit man responsible for preparing match day kit at both home and away games. 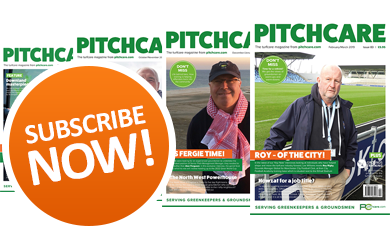 "Travelling to the away games gives me the opportunity to talk to the opposition groundstaff and discuss pitch issues," say Michael. "Not surprisingly, we all have similar problems!" "When I joined the club we had very limited equipment," he says. "A Sisis Hydromain with spiker and brush attachments for the aeration and clean-up work, an old Ford 2120 tractor to tow it, and a Greens hydrostatic reel mower for the pitch." "Now, we have a much wider range of equipment. The club has, on my recommendation, invested heavily in machinery in recent years. The management understood that purchasing our own equipment would save money in the long run. Basic renovation costs were going through the roof, so we had to look at ways of doing it ourselves." "The initial outlay for machinery is minimal - it's just a deposit. The first items we bought were a Redexim Verti-drain 7316, a BLEC seeder and a New Holland TC27D tractor. 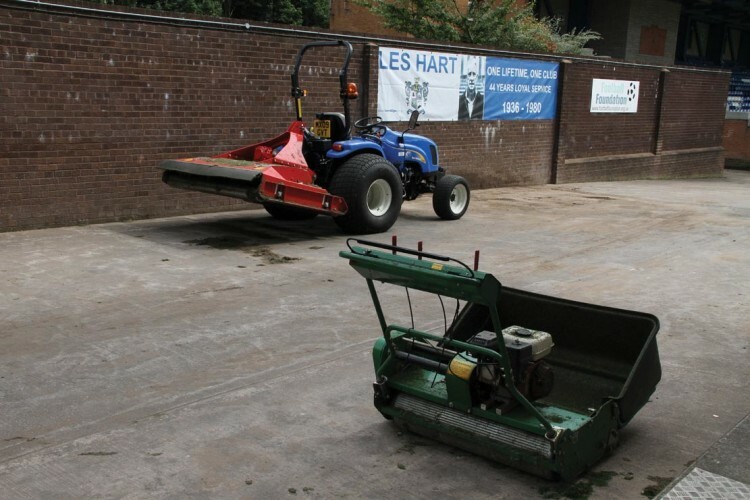 Then, as the need to improve our training facilities grew, so we bought the first of our Trimax mowers as, before that, we were relying on an old set of gangs to do the job, but they simply couldn't cope with wet grass." "A visit to the Harrogate show one January with a couple of our directors ended with the purchase of our very own Koro Field Topmaker. Since then we've also purchased a New Holland TC35DA tractor, a couple of Dennis G860s - great machines - a Dakota Topdresser, Imants Shockwave, SISIS Maxislit and various smaller items, such as walkover sprayers, linemarkers, a dragmat and a small rotovator." "So, for the past five or six years, we have been doing most of the renovation work ourselves. It's not the perfect solution but, every year, we learn more on how to improve things and make sure we don't make the same mistake twice, believe me, there's been a few! But, we sort it in the end." All the pitches, including the stadium pitch, are traditional soil based, but have had some surface drainage installed over the years. A civil engineering company installed a new primary system in the stadium pitch in 1994 and then, in 2003, Michael used the drill and fill method to sort out some localised drainage problems. In 2006, the pitch was whizz-wheeled at 2m centres, topdressed and de-compacted. "The end of season renovations centre around a proven work schedule, although we are learning all the time," says Michael. "The pitches are fraise mown, taking off 15-20mm of vegetation, power horrowed, topdressed with 40 tonnes of sand and reseeded with Johnsons Premier Stadium seed mix. 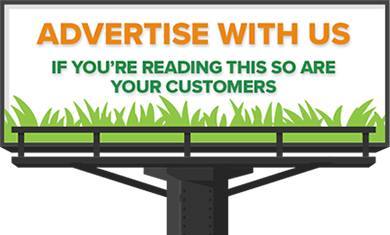 A 9:7:7 NPK fertiliser is applied to promote growth." "We watered the stadium pitch with two tripod sprinklers, and the warm May and June weather saw excellent germination. This was followed by a hose pipe ban - the first in the north-west for decades - and a 130mm of rain in July - end of hose pipe ban! The joys of living in Manchester." "Once the new grass was past the two leaf stage, we began cutting with our Hayter Harriers to encourage tillering and, after a couple of weeks, moved over to our trusty Dennis G860 mowers, cutting at match height of 27mm." The training ground currently provides one senior size pitch and two larger training areas. "We vertidrained all the pitches, applied over 140 tonnes of sand and 70/30 rootzone material and oversowed with Johnsons Premier stadium mix," states Michael. "With two teams using the stadium pitch, there is quite a lot of traffic in terms of games, training and warm up activities. Last year we had to accommodate over sixty matches!" "We generally cut and mark out on match days," says Michael. "We start around 7.00am and have it all done by 10.00am. Then we put the nets up and check the rest of the stadium to ensure that all is in order." Michael will have sorted the match kit out on the Friday night. However, once the game is over, and whilst his staff are replacing divots and cleaning up the pitch, Michael will be getting the kit washed and sorted before he goes home. "Saturday's tend to be long days," he sighs. 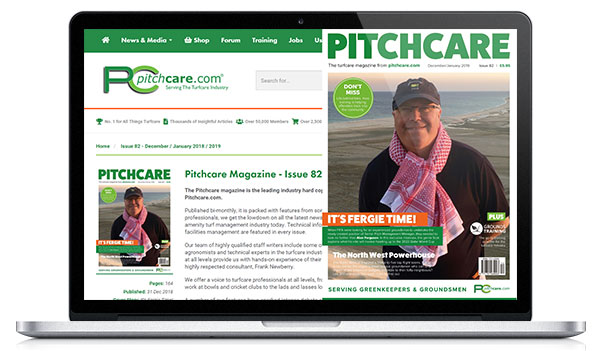 "As with most soil based pitches the winter time is the most difficult period for keeping grass on the pitch, and retaining any form of growth can be difficult, especially in shaded areas, where there can be several degrees difference in soil temperatures." "We vertidrain every fortnight, changing the depth as I see fit, and add a 20:10:10 NPK every few weeks. I back that up with a slow release 16:0:9. This method seems to being doing the trick! The only real disease problem I get is red thread, and that is soon treated with a dose of feed." It would seem that Michael is winning the battle to improve his pitches. 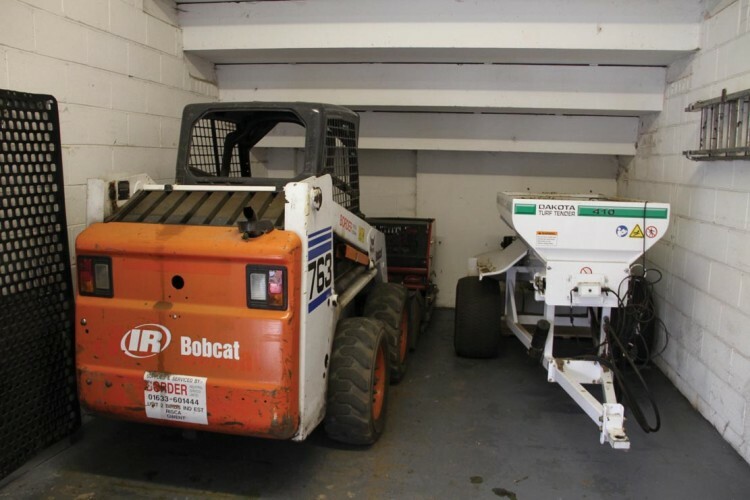 The club's recent investment in machinery should be applauded; without it the groundstaff would struggle to keep up with the requirements of an ever demanding football club. Today, it is not just about maintaining the stadium pitch to a high standard, the training ground must also perform in terms of performance, presentation and playability. 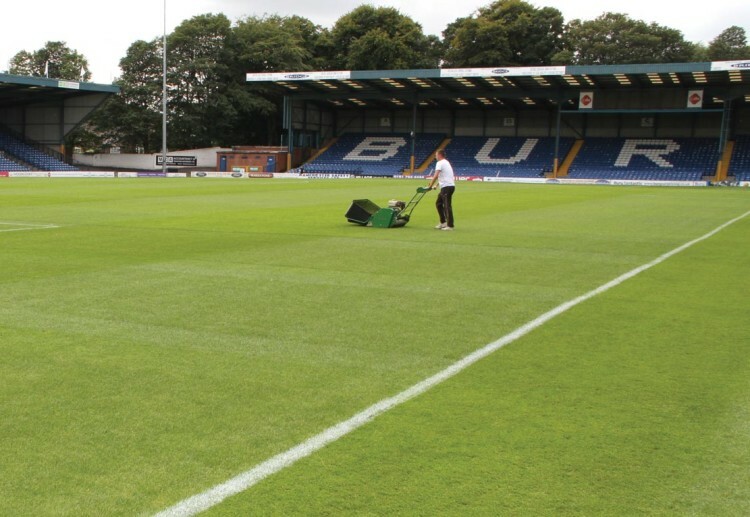 Michael and his team understand the needs of Bury FC. They, and the club's management, are to be congratulated for being proactive in, what are, difficult times for football clubs at all levels.